Kerala is an extraterrestrial tourist destination of south India where travelers come from across the world. As all are aware that the Backwaters in Kerala are a “not to miss” feature of Kerala. Perhaps Kerala Tour Packages is incomplete without a stay on a houseboat or at least a day cruise along the backwaters. In fact Kerala Honeymoon Packages are incomplete without a backwater cruise on traditional houseboats of this state. 44 Rivers, A vast network of lakes, 1500km of labyrinthine canals, Snake boat races, Floating markets etc make up the enchanting backwaters of God’s Own Country. Cruising through these backwaters is a never before experience for travelers. Leave all your stress of daily life for a day and relax in a healthy surrounding in Kerala backwaters on a houseboat. 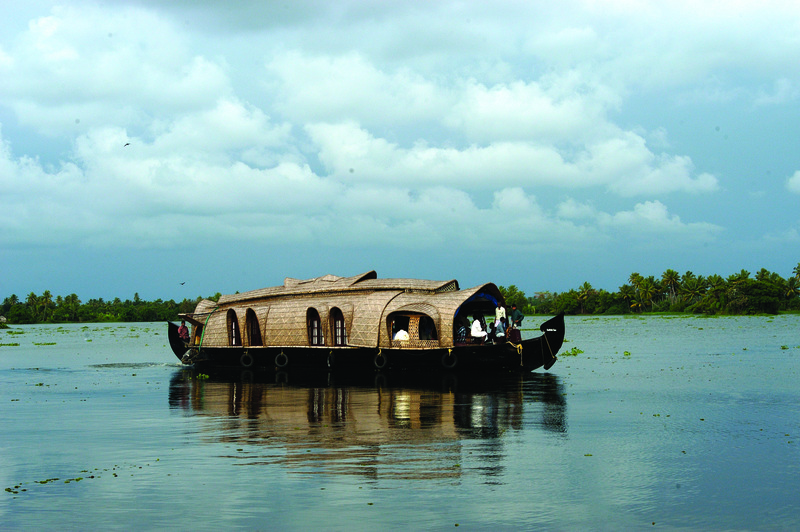 Houseboats are also known as Kettuvallams in Kerala. Ancient days, this boats were used to transport goods from a place to the other by means of water ways. When it was reintroduced as an accommodation option for tourists, this has been converted similar to a hotel room where you will have an A/c Bedroom, Living Room, Kitchen, and Balcony & Toilets adding it to a luxurious water vessel for cruising along the backwaters. Starting from non air conditioned for budget travelers, even 5 star rated houseboats are available as on date. Travelers can hire these houseboats on rent for 01 night or as per their requirement, even for longer durations too. The backwater cruises offer sheer natural sceneries, bird watching, paddy fields in extreme greenery, typical Kerala villages, mud houses, row of palm trees etc. The breath taking views would last in your lifetime memories. Kumarakom is the internationally renowned backwater tourist spot of Kerala. Surrounded by Vembanad Lake, Kumarakom is formed of a group of little islands with narrow & wide canals covered with water inlets. Natural beauty & rich flora and fauna make this destination peculiar among other tourist spots. Another attraction is the Bird Sanctuary located here, where travelers can reach during morning hours to get sights of variety of birds including the migratory birds. Bird lovers from across the world visit the sanctuary as part of their holidays & vacations for rejuvenation. Imagine yourself amidst lush green surroundings with colorful and cheerful birds. No wonder this will rejuvenate you to the hilt. Frame some of the beautiful birds in your camera as part of everlasting memories. Park is spread over an area of 14+ acres on the southern bank of Kavanar River. Some of impressive inhabitants of the park are heron, moorhen, owl, parrot, darter, flycatcher, lark, teal, Siberian crane, teal etc. Ideal time to visit the sanctuary is early morning as mentioned above to get sighting of various birds.